Light Up Wall Mount House Number Plaque - - personalized LED-powered plug-in sign illuminates your address for better visibility, provides landscape lighting, and enhances curb appeal. Made in USA. Personalized with your choice of lens color, font, power option, and the house number you provide. Five font options (click first small image): twcent, century 751, poor richard, brushed script, and vonique (shown in large image). House number line holds up to five (5) 3-7/8" high-visibility numbers. Dimensions: 12.5"W x 6.5"H x 1"D.
Plug-in installation requires an electric source but not a switch (see small image on right for instructions). 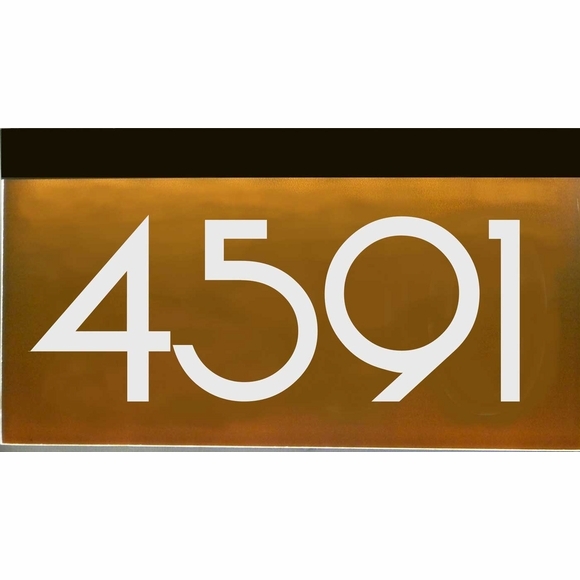 House number shown in large image: 4591. Q: Can this be hardwired to 120V? A: It can not be directly hardwired to a 120V outlet. It can be hardwired to a 12V transformer. Most door bell transformers have a 12V terminal that can be used. I installed 2 house number signs, one on each side of a lamp post. They look great, are very bright, and easily readable in daylight and at night. Great product and great service.